Brittney Mitchell Animal manager holds a newborn Pygmy Goat that will ready for children to pet during Baby Animal Days at America West Heritage Center located in Wellsville. America West Heritage Center is working at full throttle trying to spruce up the place for Baby Animals Days. The Center is holding their Baby Animals Days April 3-6 from 10 a.m. until 6 p.m. each day. 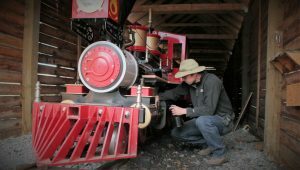 Josh Kemp, a Manger at the America West Heritage Center, checks the oil on the train that will give rides during Baby Animal Days. There will be new lambs, piglets, calves, kids, foals, chicks, ducklings and even baby bears. The Candy Cannon will be shooting out sweets daily at 11:30 am and 2:30 p.m. 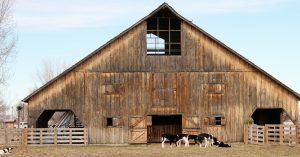 Chance Getz, the farm manger, said things are busy around the farm right now. Jerrilyn Nyman, the front desk assistant manager, said this is the biggest fundraising event the center has during the whole year. Programming Assistant Manager Annalise Christensen, getting ready for her 9th annual Animal Days, was refining iron pyrite, or fool’s gold, to put in their mining operation down in a hollow. Young calves in a corral behind one of the barns at America West Heritage Center. The calves will get a lot of attention in the coming days when crowds of children will come to see the animal. Brittney Mitchell, the animal manager, is correlating all the feeding for all of the animals. Managers Katie Andrews and Josh Kemp were pulling down decorations from earlier activities now that the snow has melted and they could get the lift out to help them with their chores. The American West Heritage Center tries to give youth and seniors a hands-on, interactive educational experience with their displays and activities. Baby Animals Days is the beginning of a season of adventures for children and families. There are also special events throughout the year. Weston Getz leads a horse back to the corral after riding at the American West Heritage Center Wednesday afternoon. The attraction blends art, history, heritage, and old-fashioned fun. Tickets for Baby Animal days are $9 for adults, and $7 for children 3 to 11. People who come with a can of food to donate to the Cache Community Food Pantry receive $1 off admission. Proceeds from the event will go to support 4-H programs and the botanical gardens. The center will be open for the event rain or shine, so dress appropriately. Refunds will not be returned due to inclement weather.